‘Tis the season for ‘best of’ lists! Over the past couple of years, I have discovered in myself a tendency to shy away from picking 10 books as my favorites. Part of this, I’m sure, is that 10 seems to be such an arbitrary number, particularly when you read from a variety of genres as I do. A bigger part, though, is that I have read over 230 books this year, and I hate thinking at the end of the year that only 4% of what I read is worth mentioning. 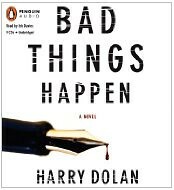 Bad Things Happen by Harry Dolan, narrated by Erik Davies – Gritty, self-referencing crime drama, with a narrator who sounded like he was born to voice this role. Feed by Mira Grant, narrated by Paula Christensen and Jesse Bernstein -Zombies, bloggers, and political sabotage, what more could you ask for in a book? This was a smart book with fantastic world building, and the narrators brought Grant’s story to life. I can’t wait for the second book in this trilogy, out in 2011. 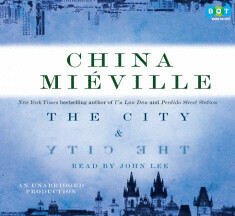 The City and The City by China Mieville, narrated by John Lee – Crime drama? Fantasty? A little of both, actually, and spectacularly done both by Mieville and by Lee. Another one with absolutely amazing world building. The Weight of Heaven by Thrity Umrigar – Gorgeous, gorgeous, GORGEOUS writing. Someone remind me to read everything that Thrity Umrigar has ever written in 2011, okay? The House of Tomorrow by Peter Borgnanni – Punk rock and geodesic domes, who would think the two belong together? This is an amazing coming-of-age story, Borgnanni’s empathy for his characters was so great that he made me care about what they cared about, even though what they cared about was not something I tend to care about. Bad Marie by Marcy Dermansky – Marie is just the most lovable damn kidnapper ever. I have no idea how Dermansky kept her from being obnoxious and ridiculous, but somehow she made me love her. The Nobodies Album by Carolyn Parkhurt – A novelist writing about a novelist, whose story is told through excerpts from the books she has written. A novel concept, and one beautifully executed. Plus there’s the whole thing with her son being suspected of killing his girlfriend to keep the plot moving. Red Hook Road by Ayelet Waldman – Absolutely beautiful writing, and a plot that was heartbreaking without being maudlin and just realistic enough to be somewhat hopeful. As an aside, Waldmman’s book of essays, “Bad Mother,” made my list in 2009 as well. The Report by Jessica Francis Kane – A fictionalization of the investigation into the worst civilian disaster of WWII-era Britain may not sound fascinating, but this was. I was particularly impressed by the depth Kane managed to impart to her large cast of characters. Outlander by Diana Gabaldon – I have been hearing recommendations for this series for years but have been intimidated by the thought of adding seven or more very hefty books to my TBR. Now I wish I had listened earlier. Getting to at least the next three books is a high priority for me for 2011. The Tricking of Freya by Christina Sunley – In addition to beautiful prose, Sunley wove Icelandic lore and tradition into this book masterfully, and without ever making the reader that she was subjecting them to an info dump. Most of all, though, Freya’s voice so absolutely authentic and amazing. Skating Around the Law by Joelle Charbonneau – So. Much. Fun. A murder in a skating rink, a a frisky grandfather, and a camel make for an enjoyable and well-written romp that I couldn’t stop recommending. The World in Half by Cristina Henriquez – Henriquez has beautiful prose, every word of which supports the fascinating story of discovery of self and family. The Heroine’s Bookshelf by Erin Blakemore – A testament to the power of the written word to work on our lives, every reader needs this book. If nobody gave it to you for Christmas, go buy it yourself right now. A Friend of the Family by Lauren Grodstein – Grodstein wrote a book I just didn’t want to put down. The story of doctor Pete Dinzinoff, what he lost, and how he lost it was absolutely gripping without feeling manufactured. Harry Potter Film Wizardry by Brian Sibley – If you had told me a year ago that an entertainment books like this would be on my ‘best of’ list, I would have scoffed, but this one is so well done and so well put together that all Harry Potter addicts need it. The Sherlockian by Graham Moore – Full disclosure: Graham and I had lunch together after I wrote my review, so if you think that unduly influenced me, feel free to ignore this recommendation, but I did really enjoy this book – never have I raved so much about pacing! It is worth noting that quite a few people I recommended this book to have read it and really enjoyed it even without having lunch with Graham. So there. Some of the above books were provided to me for review. This is a great list. Some I’ve read, some I haven’t. I am truly amazed that you were able to read so many books. Wow, great list. I have The Sherlockian on my wish list. It seems that everyone who’s read it, loved it. Many of these titles are new to me, and i’ll be noting them down. Happy Holiday! I LOVED Bad Marie. The Sherlockian was awesome also. I really want to read The Heroine’s Book shelf at some point. You must read THE HEROINE’S BOOKSHELF as soon as possible, every book lover needs to. Your gushing has caused a bit of spending on my part this year, but I’m glad I listened. (BTW, I have that Harry Potter book sitting on my coffee table, and I pick it up at least once a day and read a section!) This is a great list, and will most definitely serve to bolster my TBR this year! The Weight of Heaven and Red Hook Road are both on my shelf waiting to be read – after reading your comments I can’t wait! I too was surprised by how much I enjoyed Bad Marie, lol. 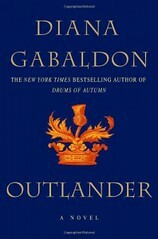 I read Outlander last January (it’s on my honorable mention list). It was a great year for reading! Wow, lots of new titles for me! I admit to being stuck in the best seller loop too much. I am currently reading The Sherlockian thanks to this blog and loving it! Janet, I’m so flattered that you picked up THE SHERLOCKIAN based on my recommendation, and so pleased you are enjoying it! Thank you so much for reading me this year. Bad Things Happen is on my Wishlist. What a great list, some new to me. Nice choices. I actually have several of these books sitting on my shelf waiting to be read. I’ve been wanting to read The City and The City for a while now, perhaps I’ll pick it up in audio instead. Why aren’t you making me read all of these? I’ve only read a handful but I want to read them ALL. I, Jen, hereby challenge you, Michelle, to read all of these books next year. The end. gosh, there is not one there that I have read. I best get to work! What a great list, Jen! I also enjoyed Outlander, The Heroine’s Bookshelf and Bad Things Happen (which was great in print). I like The Nobody’s Album, too. I am not sure why it didn’t make my list. I’m currently listening to the Sherlockian. I can’t wait until I’m able to discuss it on Twitter. I’m really enjoying it so far. The narrator is fantastic. I have Bad Marie and A Friend of the Family on my Kindle. I got A Friend of the Family after reading your review. So many people also loved Bad Marie. I think that will be my next Kindle read. The Tricking of Freya, The World in Half, In the City in the City, and Red Hook Road are all on my TBR. I remember looking at Red Hook Road while at The Bookstore. Thanks so much for your year in review. Here’s to a great 2011. Who knows, maybe Freedom will end up on both of our lists next year. I’m looking at your list and saying (*head slap*), why didn’t I include that book? Great list. Of all the books you listed that I’ve read, I have to say I felt similarly about them – you’ve obviously raved about some fantastic books! It’s also down to you that I acquired The City & The City and The Heroine’s Bookshelf; I expect I’ll be reading those two in 2011! The Sherlockian and the Tricking of Freya are both on my wishlist as well. I would love to read The Sherlockian, but I need to read the “real” Sherlock Holmes first…or at least make an effort toward finishing those stories first. What doesn’t help is that I’m also addicted to Laurie R. King, whom I saw you also reviewed recently and enjoyed…and now you mention this! Thanks a lot, lady ;). Yeah, reading a few stories would be good, but three or four of the short stories won’t take you long. I loved FEED! I need to read Red Hook Road and The Sherlockian. Great wrap up. Off to order HEROINE’S! YES! Even you, who wants simplicity, MUST OWN THAT BOOK! A couple of these are on my list but some I’d never heard of! The only one I had read was Outlander. Skating Around the Law sounds like something my sis would enjoy. Thanks for the suggestion. Incredible list here. I loved Bad Things Happen and The Tricking of Freya as well, and want to read so many more from this list! I remember your review of Red Hook Road and that it made me want to read the book, now I just have to go out and get it. Great list! I love seeing what everyone loved from this year. I added The City & The City and A Friend of the Family to my Amazon order. Happy New Year! Wow, so many good books! I haven’t heard anything bad about The Weight of Heaven, so I’m excited to read it. I also loved The Tricking of Freya — it was on my best of list too. I like the way you did this post. I really liked The Weight of Heaven–but then, I love anything by Thrity Umrigar. I was, however, disappointed in The Nobodies Album. I’m looking forward to reading The City & the City one of these days. I received THE HEROINE’S BOOKSHELF for Christmas, and your review was one of the things that influenced me to ask for it! A FRIEND OF THE FAMILY is in the TBR stacks. And Ayelet Waldman has made my year-end list for two years in a row as well, which officially makes her one of my Must Read Authors. Great picks! The ones I’ve read, I definitely agree with, and the ones I haven’t, I need to make a priority! I’m reading the second book right now! I love the criteria you used (“books gushed about” in compiling this list. I did a similar thing with my list — it’s just too easy to feel guilty about not including ALL the books I read and enjoyed! I recently ran across Red Hook Room and added it to my list; now I’m going to have to put The Sherlockian on it too. Thanks! Thank you, Mindy! It was really very helpful to me in trying to figure out what belonged and what didn’t. Simply saying books that were fabulous this year would probably have been twice as long.